Leah on the Offbeat is in my eyes fan service and I am very sad of this. Yes I did read it in just one day, because I thought the story had something. But I felt the characters were very predictable and not very interesting. 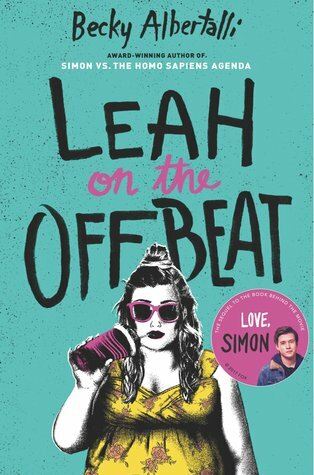 I give Leah on the Offbeat by Becky Albertalli two out of five hearts because I really wasn’t happy with this book. It felt like fan service and to help promote the movie Love, Simon even though the movie was released in March 2018 and the book in April 2018. Leah is bi and hasn’t come out yet even though Simon has and is happily dating Bram. She goes from flirting with one guy to then flirting with her fling from the past and I felt like I got a whiplash because of her behaviour. The story is slow and felt like Albertalli just took a year in her own life and wrote about it, or something. These are the story I really don’t care about. If I hadn’t enjoyed some of the banter of the group I would even have given the novel only one heart. This entry was posted in Book Review and tagged Becky Albertalli, Book Review, Contemporary, LGBT, Romance. Bookmark the permalink.